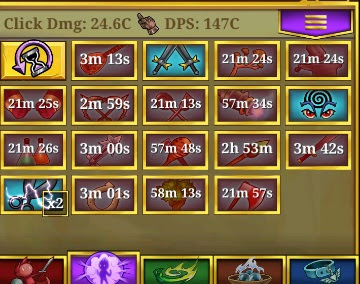 Let's talk a bit about your Everclicker Heroes. Heroes are your battlers. The higher the level they go the higher your click damage and dps go. After defeating an Devourer, you will need to level your heroes again. When I first started Everclicker I use gold explosion and geyser to get enough gold. I awaken my heroes then level each my +25 levels, learn talents and so on. 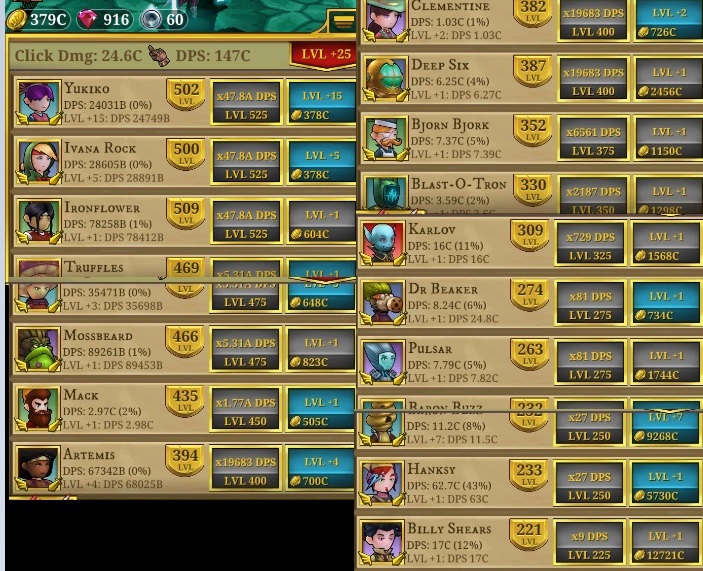 Level them as high as possible like I said the higher the level by 25 the more damage, as seen in above image. Hero powers, I only use these to defeat bosses or Devourers. I usually go a few on normal bosses, more on warp bosses and then I set up some with supercharged powers for Devourers. The order I go is, across top hitting each one, as needed. Then, I use Baron Buzz. I leave Karlov and Dr. Beaker for last. Karlov , stuns and Dr. Beaker mimics. So wait until Karlov is completed before you use Dr. Beaker. Heroes and how you use them are personal preferences if you find another way that works for you please post after in the comments. 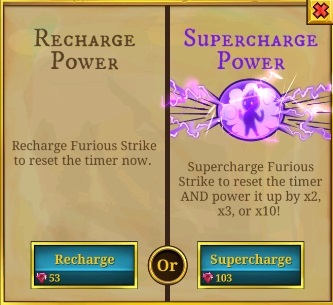 You can recharge powers or supercharge powers. Supercharging can give you from x2 to x10 the power. I wait until the very last few minutes before the power recharges itself to supercharge, it costs less gems and I only supercharge one I might be using. Not all heroes supercharge. Click on the little door on the top left of your game screen, (image below). This takes you to your Feasting Hall. In the Feasting Hall you can level your cooking pot craft powers, do hero quests and enchant weapons. I want to discuss Hero quests and enchanting weapons, although crafting spells and leveling your cooking pot are very important, quests and enchantments are even more. Click on the purple tab with wings. Under this tab you find Hero quests, now uncheck ready to cast. Now you can see all your Heroes quests and the items needed to cast them. Now recheck the ready to cast, these are quests you can do right now. You can only do one quest at a time. Once that quest is finished you can do another. 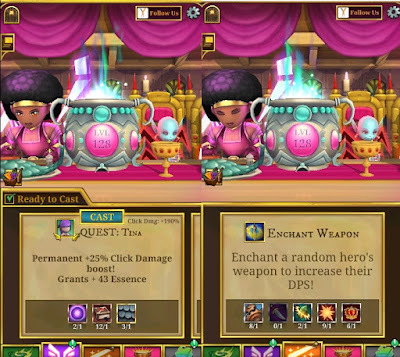 Weapon enchantments are the same thing once you have the items you can enchant your heroes weapons. You get a choice to re-roll or enchant. One thing to remember is everything stacks in this game. Do your weapon enchantments and hero quests over and over as you can. Items for these and crafting power are dropped during battles or clicker pots/critters. Spells are crafting under the green tab. I like to use level two or three blood lust for defeating bosses. Again, personal preference. 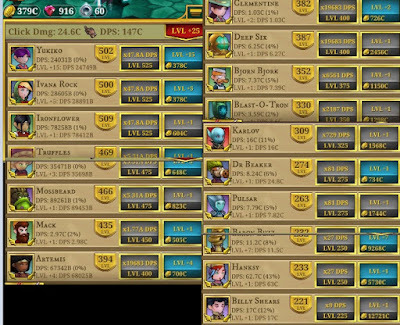 Hope this helps you understand EverClicker and your Heroes.